“Pizzica masters stomp into rapture” – The Guardian “The superstars of pizzica are back. Brave and bold, Canzoniere is the sound of pizzica opening to the world like never before” – Songlines Formed by writer Rina Durante in 1975, Canzoniere Grecanico Salentino (CGS) is regarded as Italy’s leading and longest-standing traditional music ensemble, hailing from the Salento, the heel of the Italian boot, in Puglia. Italy’s fascinating dichotomy of tradition and modernity come together in the music of CGS: the seven piece band and dancer are the leading exponents in a new wave of young performers re-inventing Southern Italy’s Pizzica musical and dance traditions for today’s global audience. 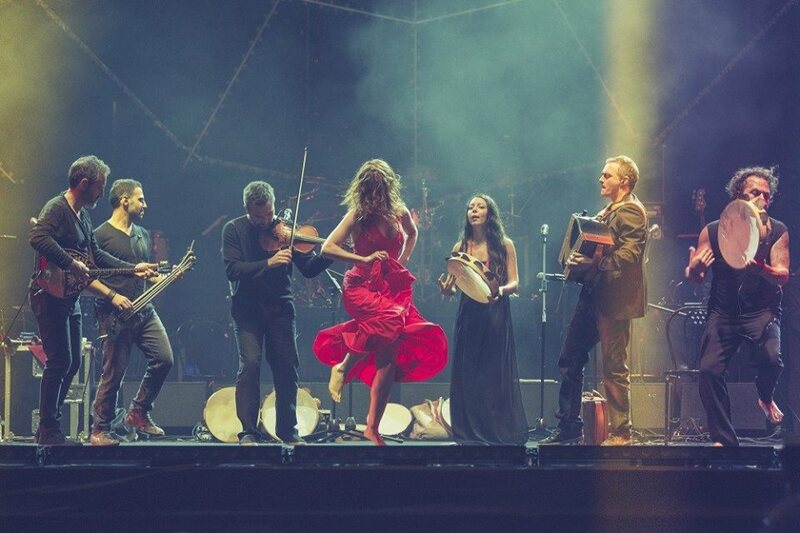 The tens of thousands who often congregate for this Lecce-based band’s concerts in Italy know: Bandleader, fiddler, and drummer Mauro Durante and company can make an audience shimmy with the energy of the ancient ritual of pizzica tarantata, said to cure the taranta spider’s bite with its frenzied trance dances. CGS shows are a life explosion: full of energy, passion, rhythm and mystery, they bring the audience from the past into modernity, and back. Leadership of the ensemble was handed down to Durante by his acclaimed father Daniele, in 2007. CGS has revitalized both the rousing and the introspective sides of Southern Italian song and dance. Durante continues to innovate and energize, bringing decades of experience playing with global artists (Ballake Sissoko, Ibrahim Maalouf, Piers Faccini), contemporary classical composers (Ludovico Einaudi), and pop mavericks (Stewart Copeland of The Police). Critically acclaimed with 19 albums and countless live performances throughout USA, Canada, Europe and the Middle East, in 2010 CGS was awarded Best Italian World Music Group at Italy’s MEI confab. Line up: Mauro Durante (voice, frame drums, violin), Alessia Tondo (voice, percussion), Giulio Bianco (Italian bagpipes, harmonica, recorders), Massimiliano Morabito (diatonic accordion), Emanuele Licci (voice, guitar, bouzouki), Giancarlo Paglialunga (voice, tamburrieddhu), Silvia Perrone (dance).